British border staff have faced threats of arrest by Belgian police for trying to stop people exploiting a loophole allowing them to enter the UK without passport checks, the BBC has learned. Passengers can travel from Brussels to Lille without showing passports as Belgium and France are both within the Schengen area. But they can then stay on the train to the UK as there are no further checks. The Home Office confirmed it was working to tackle the "Lille loophole". The Schengen agreement allows passport-free travel between some European countries, but the UK is not a signatory. Passengers with tickets from Brussels to Lille can board the train to London without showing a passport, but no-one checks whether passengers actually get off the train at Lille and UK Border staff do not perform checks on board. So passengers can continue on to London St Pancras, without going through further passport control, and illegally enter the country. Radio 4's The Report has seen internal UK Border Agency (UKBA) correspondence highlighting the loophole, and the threats being made to staff trying to tackle it. One UKBA officer describes an incident in April at a Brussels station where he stopped two Iranians who he said "bore all the hallmarks of Lille loopholers". After they were questioned the Belgian police intervened. One officer shouted: "This has got to stop. You are not in Britain now, you are in Schengen. If they make a complaint you will be arrested." The BBC has seen other emails describing clashes this year between UK Border Agency staff and Belgian federal police. This led one officer to warn that many staff he had spoken to were so scared of being arrested by the Belgian police that they "will now turn a blind eye to potential Lille loopholers". The issue has been discussed at the highest levels of the UK Border Agency and the Foreign and Commonwealth Office. An email from a senior director to staff in May this year stated that the British Ambassador to Belgium had "voiced UKBA concerns on border controls for Lille passengers" to the Belgian immigration minister. The Home Office minister Damian Green confirmed that both he and the Home Secretary Theresa May are aware of the loophole. "Any loophole in our border defences is a matter of concern," he told The Report. "It's one of those things that the British government can't solve on its own… that has to be solved in negotiations, and that's what we're now doing." He added: "There are strict British immigration controls in place in France and Belgium and we have UK Border Agency officers based at St Pancras to target those we believe are intent on entering Britain illegally. "We are currently working closely with our Belgian counterparts and Eurostar to resolve this as quickly as possible." The government could not say when the loophole will be closed or how many people had exploited it. The chairman of the Home Affairs select committee Keith Vaz told the BBC he was "astonished" by news of the loophole, and by the government's response to it. "The minister is taking what appears to be a very casual approach to this very serious issue," he said. He said he would question Jonathan Sedgwick, the acting chief executive of the UK Border Agency, about the matter when he appears before the select committee later. 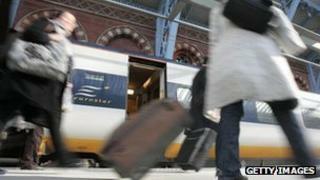 "If a simple railway ticket can give you entry into the UK, this is a cause for real concern," he added. The Report is on BBC Radio 4 on Thursday 8 December at 20:00 GMT. Listen to the full programme via the Radio 4 website or download the programme podcast.